← Day 22: The New Knock Knock. So today’s new thing actually stemmed from a random act of good karma, even though it might sound a little self-indulgent. These two friends of a friend, Brad and Galo, are selling everything they own to drive out west and live in a tent for four months to learn how to be natural builders in sustainable cob construction. To help fund the trip (all those Timmy breaks don’t pay for themselves), they organized a couple of Ultimate Spa Days, Brad being the former proprietor of a couple of spas in the GTA. And what girl couldn’t use a little ultimate anything, especially on a Friday? The guys lined up some therapeutic friends of theirs to round out the suite of offerings. The package included your choice of 3 of about 7 different services for a grand total of $75. Not too shabby! I opted for a shoulder and neck massage, a hand polish with deep moisturizing paraffin treatment, and, my new thing for the day, Ear Candling. Some, okay, many might consider the treatment a little hokey or even dangerous, Health Canada included; however, I knew a lot of people who had been getting it done for years without any issue, and who were very happy with the results. So, I thought I’d try it for myself. After all, that’s kind of what this whole year is about. 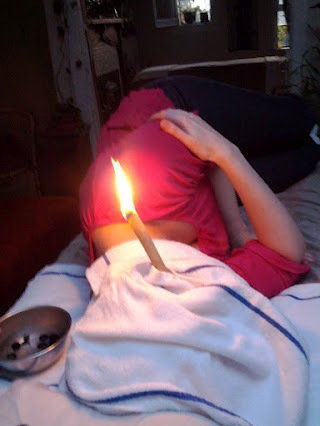 We started with the candling, which is a good thing, because it was giving me a little anxiety, having read the above ‘avoid for your own safety’ messages. Sometimes, I really do think ignorance is bliss, and this is definitely one of those times. The procedure began with putting my hair into a very unflattering, yet stylish cap, and lying down on a massage table on my side. I then stuck one of the hollow candles into my ear, as far down as it would comfortably go, trying to keep it is as upright as possible. The Candler (my term, because it somehow reminds me of The Riddler) arranged a towel at the base (i.e., over my face) to avoid any wax falling on me, and then she lit it. 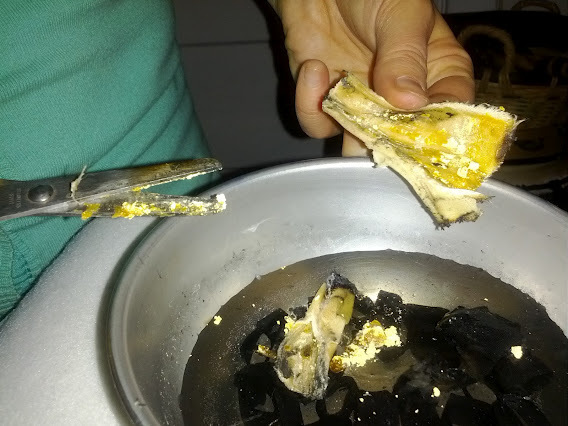 I heard a crackling sound as it began to burn, but I didn’t really feel anything until the candle burned down close to my ear giving off a fair bit of heat. During the ten or so minutes it was sizzling, The Candler frequently snipped off the charred part of the wick into a small metal bowl of water. When it was done, The Candler pulled it out of my ear, blew out the flame, and snipped open what was left of it, to show me the bits of gunk it had sucked out of my ear. In two words, ew gross. Ew, gross! There are no other words. The procedure was then repeated on the other side with slightly better results (more goo). I then sat up to give my new supersonic hearing a try, listening for the crickets fervently rubbing their legs together in High Park. To be perfectly honest, I didn’t notice much of a change, but that may have something to do with the fact that I’m a fairly regular Q-Tipper so there wasn’t all that much wax in there to begin with. Still, it was a pretty neat experience. 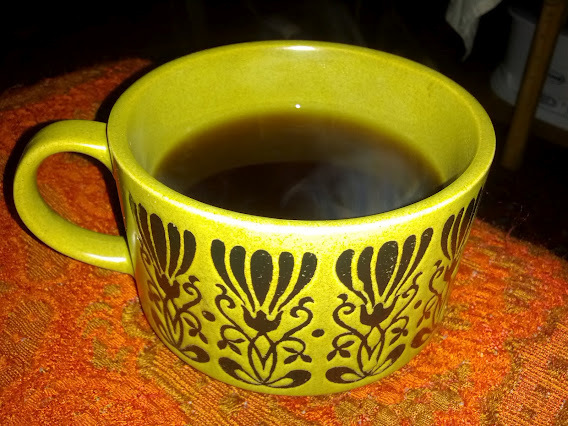 Afterwards, Anna, a homeopathic practitioner and the person in the group I knew from skiing/snowboarding, gave us a steaming cup of Chaga tea, using mushrooms she had personally harvested. Chaga mushrooms are the latest superfood with even more anti-oxidants than Goji berries. The tea is absolutely delicious. I then proceeded to become a human penguin, converting my hands into flippers coated in paraffin wax, and let my upper body be massaged into mush to round out the evening. Finally, I reluctantly left what felt like a cocoon of positive, lovely energy and, rather than pouring myself into bed, met up with a friend in the hood for a couple of bevies at some new local haunts. All in all, a fairly fantastic Friday. If you are wanting to help fund a tank of gas for the boys’ wonderful western adventure, I think there are still a few spaces left for the last Ultimate Spa Day on Saturday, April 7th. Click here to reserve your ticket and choose your own perfect blend of pampered bliss (scroll down for details on the offerings). Go on, you know your karma can use it! This entry was posted in Health and tagged Chaga tea, cob construction, ear candling, health, karma, March, natural builder, spa, Ultimate spa day. Bookmark the permalink. 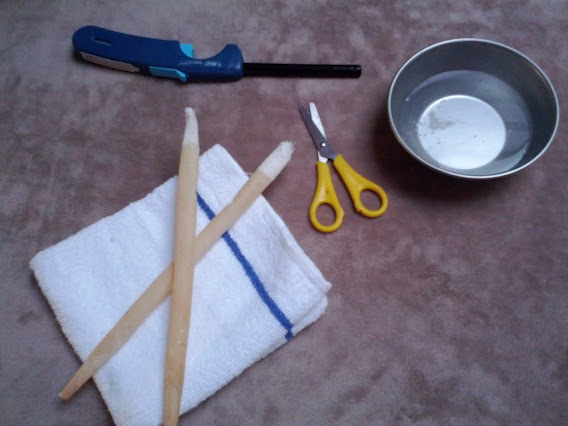 4 Responses to Day 23: Ear Candling. That picture of your ear on fire, pretty priceless. I’ve been interested to try this, still hesitant though…. would you do it again? Hmmm… great question. I don’t have a pressing need (been perspiring out all the ear wax lately), but I probably would do it again if it was being done by an experienced practitioner whom I trusted. For example, Karryn has been doing it for years. If I had swimmer’s ear, I’d definitely give it another go. For regular maintenance? Probably not. Glad I tried it, though!